Archival records are organized according to who created them -- the government agency, the person, family, or the private organization - rather than by subject. Archival records can be searched by subject using indexes and keywords. Fonds: Yukon Archives holds the records of the White Pass and Yukon Route Company. The term “fonds” applies to the entirety of the records by a certain creator. The fonds-level description in the database gives a general overview of all the WP&YR records held by Yukon Archives. Series: Within the WP&YR fonds, there are many sub-groupings called series. One of these includes the records of the River division which document the activities WP&YR undertook related to river transportation. Sub-series: A series may be further divided into sub-series. One sub-series of the WP&YR’s records includes Sternwheeler log books. File or item: The final level of description would be a file (e.g. of correspondence) or an item; in this case, the log book of the Bonanza King constitutes one item within the sub-series. Yukon Archives may not have all these levels currently available on the Archives Descriptive Database. In some cases, paper-based inventories in the Yukon Archives Reference Room may be consulted. The database is updated regularly. If you choose this option, you will search general descriptions of groups of archival records at the fonds, sous-fonds, series and sub-series level (see the diagram below). This is the most inclusive database, providing an overview of the holdings of Yukon Archives. If you choose this option, you will search brief descriptions of individual files or items such as letters, maps, sound recordings, moving images, photographs and architectural drawings. Where applicable, each file or item described includes a link to the larger group of records to which it belongs. Start with this search option if you have a very specific research question. If you choose this option, you will search descriptions of Yukon government agencies, municipal governments, families, persons, and private sector organizations that have created the records held by Yukon Archives. Each description of a record creator includes links to descriptions of the archival records it has created. Start with this search option if you wish to know what records Yukon Archives holds that were created by a particular Yukon government agency, municipal government, person, family, or private sector organization. The Archives Descriptive Database will not answer most genealogical research enquiries. Please contact the Yukon Archives Reference Room for information on family history resources available at Yukon Archives. The Archives Descriptive Database is not a complete inventory of our holdings. New information is added regularly to the database. Some fonds and collections can also be searched using Yukon Archives' finding aids in PDF format through the Finding Aids link on the Yukon Archives website. Any of the search options may lead to information relevant to your research. Depending on your question, you may want to try all search options using keywords appropriate to your subject of interest, and then follow related links. The search results are linked together where appropriate. 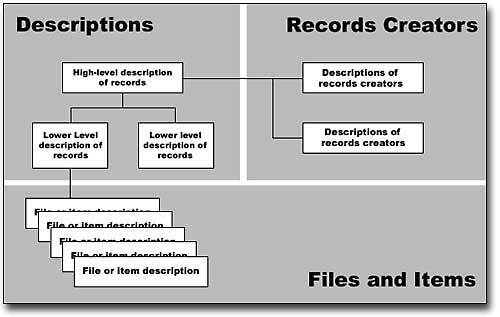 For example the description of a file and item is linked to the larger group of records of which it is a part, and creator records are linked to the corresponding archival descriptions. If you choose this option, you will search general descriptions of groups of archival records at the fonds, sous-fonds, series and sub-series level (see the diagram above). This is the most inclusive option, providing a comprehensive overview of the holdings of Yukon Archives. In some cases, it includes links to descriptions of files or items. Use this search option for broad research questions. Keyword: You may enter any number of keywords. A keyword search will undertake a full text search of the Title, Scope and Content, Brief Admin. History/Bio and General Notes fields within the database. 1. All of these keywords: This is the default option. Choosing this option will return database hits that include all of your search terms. 2. Any of these keywords: Choosing this option will return hits that include any, but not necessarily all, of your search terms. You may limit your search to search only those groups of records that contain a particular format of material such as textual records, photographs, maps,, etc. Choose an option from the pull-down menu. You can truncate your search using *. This will locate words that have a common stem. Example: Entering farm* will match farm, farming, farmer, farmers, etc. The results of your search will list all of the hits in a brief form that includes the title and the dates that the material was created. Click on the title for a detailed description of that group of records. When was the material created? Who or what office created the material? When available, the descriptions may also provide links to descriptions of files or items and/or online finding aids. If you choose this option, you will search brief descriptions of the files and items in the holdings of Yukon Archives. The Archives Descriptive Database provides access to a small number of digital copies of archival records (predominantly photographs). File and Item descriptions also include links to the larger body of records that the file or item forms a part of (where applicable). This database does not contain all files and items at Yukon Archives. New entries are being added on a regular basis. In many cases, however, you will have to consult a paper-based list in our reference room, or consult reference staff, to find the records that you are interested in. Keyword in Title: You may enter any number of keywords. This option searches the title of descriptions in this database. You may limit your search to a particular format (e.g. photographs, sound recordings or maps). Choose an option from the pull-down menu. You can truncate your search using * . This will locate words that have a common stem. Example: Entering trap* will match trap, trapping, trapper, etc. Provide information in this field to reference staff to view records. If you choose this option, you will search descriptions of Yukon Government agencies, municipal governments, persons, families, and private sector organizations that have created the records held by Yukon Archives. Each description of a record creator includes links to descriptions of the archival records it has created. Start with this search option if you wish to know what records Yukon Archives holds that were created by a particular Yukon Government agency, municipal government, person, family, or private sector organization. Keyword: You may enter any number of keywords. A keyword search will undertake a full text search of the Name, Function, Bio./Administrative history, Other Information, Variant Name, and Parallel Name fields within the database. Keyword in Name: You may enter any number of keywords. This option searches the names of Yukon Government agencies, municipal governments, persons, families, and private sector organizations that have created bodies of archival records. You may limit your search by choosing a type of record creator using the pull-down menu provided. You may choose from: All Record Creators (default), Government Agency, Person or Family, Private Sector Organization. The results of your search will list all of the hits in a brief form that includes the name of the Yukon Government agency, municipal government, person, family, or organization. For Yukon Government agencies, the date that the agency operated will also be included. Click on the name for a detailed description of the record creator. Included here will be links to descriptions of archival records in Yukon Archives' holdings that the agency, person, family or organization created. You can save selected records to a clipboard. From the clipboard, you can download these records to print or save them to a file, or email them to your email address or any other address. You can save records across all three search options (Archival Descriptions, Files and Items and Record Creators). The clipboard is cleared when you leave your search session or if you press Clear Saved Items. Check the checkbox next to a record to save that record to the clipboard. You can check multiple records from multiple pages of the brief result. Save Selected Records saves the records that you have selected. Save All Records on This Page saves all of the records on the current page. You don't need to check these records. View Clipboard allows you to view the clipboard. A running total of records that you have saved will be displayed. Clear Saved Items clears the clipboard and re-sets the display of records saved to 0. When you have selected records by checking them and pressing Save Selected Records, or by pressing Save All Records on This Page, a checkmark will appear beside each selected record. Save This Record saves the current record to the clipboard. After you have pressed this link to save the record, this link will disappear from the page to indicate that the record has been saved. When you press View Clipboard from any results page, you will see the records you have saved. Up to 25 records are shown per page. You can use the page index above the records to move between pages. Return to Results takes you back to your results page. Emailed Saved Results takes you to an email form. The sender address, subject and message are already filled in but you can replace them with your own information. You must fill in the recipient address, which can be any email address (e.g. if you are searching this website for someone, you can email the saved records directly to their email address). The "cc" address is optional. Press Email Saved File Now to send the email. The saved records are sent as an attachment to the email, in an RTF document. Print/Download Saved Results to File takes you to the download page. Press View Your File to Print or Save. This will open an RTF file containing your saved records, giving you the option to save or print it. Delete All Saved Results clears the clipboard. Removed Marked Items removes selected records from the clipboard, after you have selected the records by checking the checkbox beside them. Save a permanent link to the record you are viewing by adding it to the Favorites or Bookmarks menu of your browser. On the full record display page, scroll down to the Record URL section. Highlight the URL displayed here. Right-click to get a menu of your browser's options. If your browser is Internet Explorer, copy the URL and paste it into your browser's address bar, then add this link to your list of favorites. If your browser is Firefox, use the Bookmark or Open in New Tab/Window options to copy and save the link. If your browse is Chrome, use the Go To option to copy and save the link. and, if your browser is Internet Explorer, IE Version 8 or later. On the Files and Items Search Results page, this icon identifies records with sound files. Click on the icon or the title to go to the full results page and listen to the sound file. You are welcome to download the sound file for research and private study only. Prior permission for any other use must be obtained from Yukon Archives. On the full record display page, scroll down to the Audio Files section. Press the arrow on the player bar to begin playing the sound file. Press the square icon next to the arrow on the player bar to stop playing the sound file. To download the sound file, click on the Right-click to Download Audio link and use the "Save" or "Save as" option to save the sound file to your personal computer.